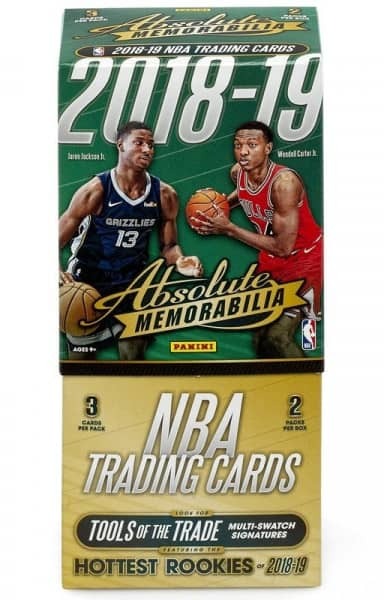 Factory Sealed 2018/19 Panini Absolute Memorabilia Basketball Hobby Box mit 2 Packs Per Box, 3 Cards Per Pack. In jeder Box: 2 Autogramme, 2 Memorabilia Cards und 2 "Unciculated Cards"
Produktinformationen "2018/19 Panini Absolute Memorabilia Basketball Hobby Box NBA"
In jeder Box: 2 Autogramme, 2 Memorabilia Cards und 2 "Unciculated Cards". The popular "Uncirculated" base cards are back. Get two per box, one veteran and one rookie. TOOLS OF THE TRADE THREE SWATCH SIGNATURES/TOOLS OF THE TRADE FOUR SWATCH SIGNATURES/TOOLS OF THE TRADE SIX SWATCH SIGNATURES: Collect Tools of the Trade Signatures three ways. Each card showcases an autograph and either three, four, or six swatches of memorabilia, featuring combinations of jerseys, hats, and basketballs. UNCIRCULATED: Collect the whole 100-card Uncirculated base set. New to the Uncirculated Base set this year are the Gold #'d/10. 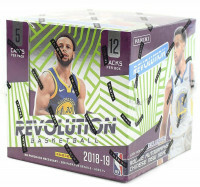 Weiterführende Links zu "2018/19 Panini Absolute Memorabilia Basketball Hobby Box NBA"
Fanbewertungen für "2018/19 Panini Absolute Memorabilia Basketball Hobby Box NBA"